'Panicked' border sprint as razor-wire goes up Jump to media player Fergal Keane reports from the Serbian-Hungary border at Horgos as the UN Refugee Agency condemns Hungary's latest response to the migrant crisis. 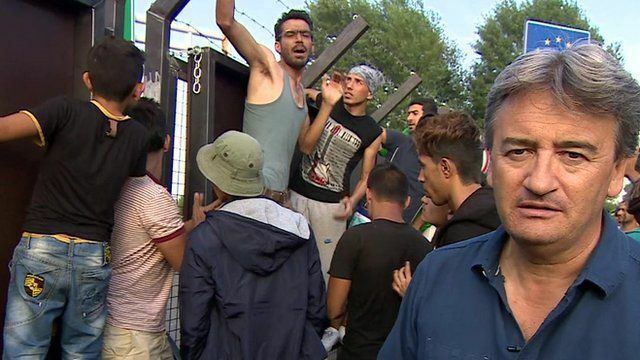 Serbia 'talking to Hungary through fence' Jump to media player Serbia's Migrants Minister Aleksandar Vulin tells the BBC the Hungarian authorities did not officially tell Serbia that they were planning to close the border between the two countries. Rush for border as Hungary clamps down Jump to media player Hungary has introduced tough new laws and tightened border controls to try to halt a huge influx of migrants entering the country illegally from neighbouring Serbia. State of emergency declared in Hungary Jump to media player Hungary has declared a state of emergency in southern districts bordering Serbia, hours after introducing tough new laws aimed at stopping the unchecked flow of migrants into the country. 'An exhausted quiet' on Greek migrant ferry Jump to media player The BBC's Fergal Keane joins migrants, mainly from Syria, making the ferry crossing from the Greek island of Lesbos to the mainland. Hungary's latest response to the migration crisis has been strongly condemned by the United Nations High Commissioner for Refugees. Hundreds of people are stranded at the Serbian border after Hungary closed the frontier by building a razor-wire fence. The aim is to stop migrants trying to enter the European Union after new Hungarian laws came into effect overnight. Fergal Keane reports from the border at Horgos.